Witek Nazarewicz - Is There an End to the Periodic Table of Elements? This year marks the 150th anniversary of the formulation of the periodic table created by Dmitry Mendeleev. Accordingly, the United Nations proclaimed 2019 as the International Year of the Periodic Table of Chemical Elements. At 150 years old, the table is still growing. In 2016, four new elements were added the periodic table: nihonium, moscovium, tennessine, and oganesson. These elements define the current upper limits of mass and atomic numbers. As such, they carry the potential to transform the way we currently understand nuclear and atomic physics, and chemistry. All elements with atomic numbers greater than 103 are labeled as “superheavy," and are part of a vast, totally unknown territory of these nuclei that scientists are trying to uncover. Questions motivating the search for these systems include: What are the heaviest nuclei and atoms that can exist? Are superheavy systems different from lighter nuclear species? Is there an island of very long-lived nuclei? Can superheavy nuclei be produced in stellar explosions? Questions such as these provide formidable challenges for science. 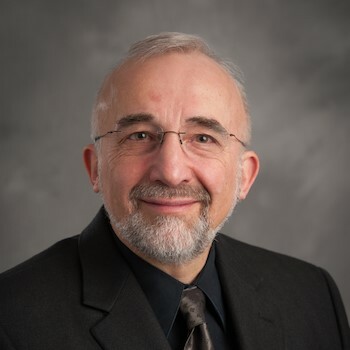 As FRIB Chief Scientist, Witold (Witek) Nazarewicz advises the project director on issues related to science, and articulates FRIB’s capabilities to the national and international science community, including potential users. He also ensures that FRIB research programs remain at the cutting edge of the field, address important science questions, and are widely regarded as well-founded, appropriate, and of high scientific impact. Dr. Nazarewicz is a John A. Hannah Distinguished Professor at MSU and a Corporate Fellow Emeritus in Oak Ridge National Laboratory (ORNL). From 1999-2012 he served as the scientific director of the ORNL Holifield Radioactive Ion Beam Facility. Until 2014, he was James McConnell Distinguished Professor in Physics at the University of Tennessee, Knoxville and Professor of Physics, Warsaw University, Poland. He has held several visiting positions, including professorships at Lund University, the University of Cologne, Kyoto University, the University of Liverpool, and Peking University. Dr. Nazarewicz is a Fellow of the American Physical Society, the United Kingdom Institute of Physics, and the American Association for the Advancement of Science. He was named a 2008 Carnegie Centenary Professor by the Carnegie Trust in Scotland, received an Honorary Doctorate from University of the West of Scotland in 2009, and was awarded the 2012 Tom W. Bonner Prize in nuclear physics from the American Physical Society and 2017 G.N. Flerov Prize from the Joint Institute for Nuclear Research. Dr. Nazarewicz authored and edited seven books, is the author of ten review papers and more than 400 refereed publications in scientific journals, with more than 23,000 citations and an h-index of 82. He has given over 280 invited talks at major international conferences and more than 290 invited seminars and colloquia. He has helped organize over eighty meetings and conferences and presently serves on eleven professional national and international committees and editorial boards.